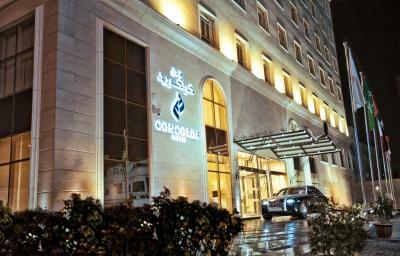 Lock in a great price for Concorde Hotel Doha – rated 8 by recent guests! 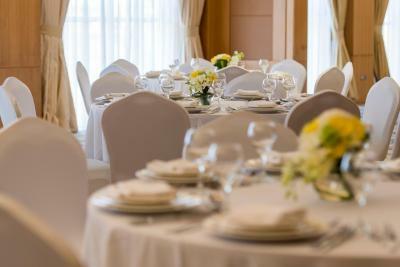 Hotel staff are very friendly and cooperative with guests. 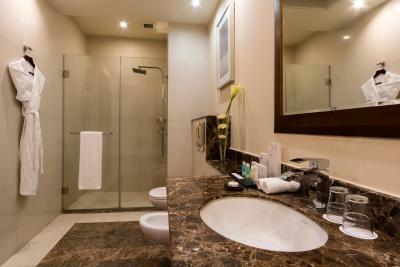 Hotels is very comfortable and services are excellent. Very good hotel but it’s not 5 Star hotel.. it’s 4 star !!! Staff was friendly and very accommodating, especially Elma in the front desk. I liked the size of my room, it was good. The gym was also good for me. Although I didn't use the pool, it presented well. As for the staff, they were terrific too. I liked the free airport shuttle service included. The tariff was more than reasonable. I found a good restaurant about 5 minutes away where locals eat and great value. 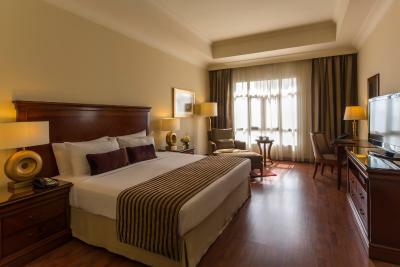 Very convenient location between the airport and central Doha, which is in walking distance (10-15 minutes). Otherwise, taxis are cheap and a very good alternative. In addition, there will be one station of the new Doha subway next to the entrance. 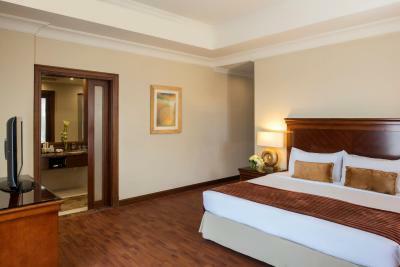 Rooms are spacious and silent, with wonderful king size beds and comfortable mattresses. 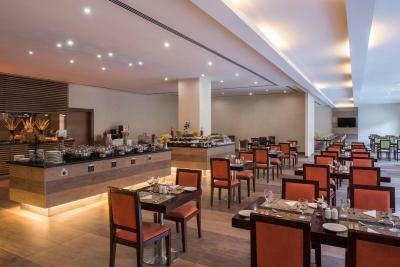 Breakfast is very good, with a wide range of choices, including fruits, bakery, dairy products and traditional arab cuisine. There is an outside swimming pool and a small gym, ideal to do some exercise after a long flight. 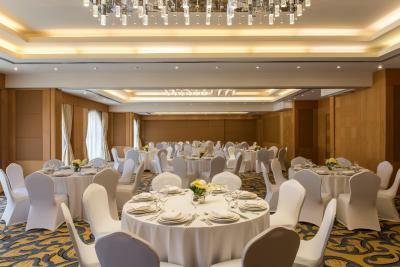 Concorde Hotel Doha This rating is a reflection of how the property compares to the industry standard when it comes to price, facilities and services available. It's based on a self-evaluation by the property. Use this rating to help choose your stay! 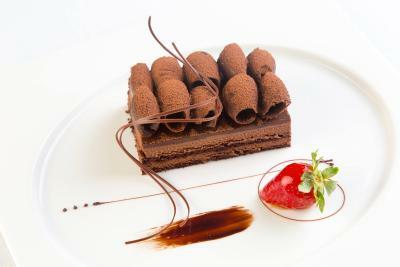 One of our best sellers in Doha! 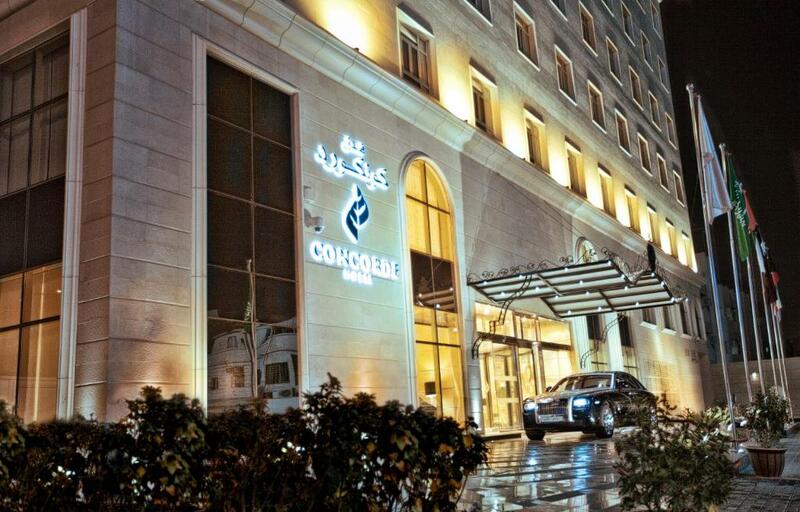 Concorde Hotel Doha is located between the Banks street and Old Airport, a 23 minute drive away from the new Hamad International Airport. Souq Waqif is only a 5 minute drive away. Free WiFi is available throughout the entire property. Airport Shuttle bus is available as per schedule. All rooms at the Concorde Hotel offer a flat-screen TV, an electric kettle, a mini bar and a work desk. Some rooms offer a dining area, wardrobe, iron facilities and a seating area. The bathrooms offer free toiletries. A great dining experience at our main restaurant “Olives” where we serve an international breakfast, business lunch and dinners. 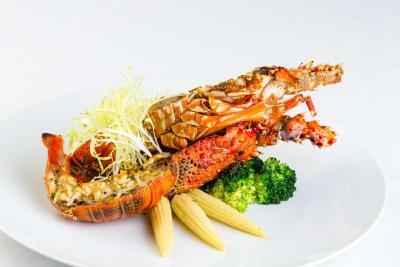 Concorde also provide an authentic Italian and French cuisine in our Corsica restaurant, where pasta and pizza are served. 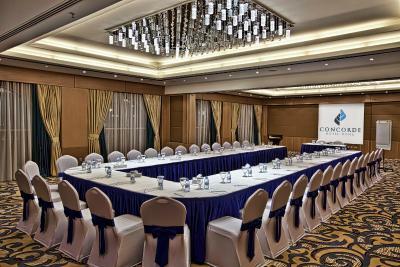 Our Meeting Rooms are welcoming our guests to hold their meetings, wedding and events. Enjoy our Spa relaxation options, sauna and Jacuzzi and 24 Hrs GYM. Corniche is an 8 minute drive away while Doha’s City Center Mall and West Bay are both a 15 minute drive away from the hotel. 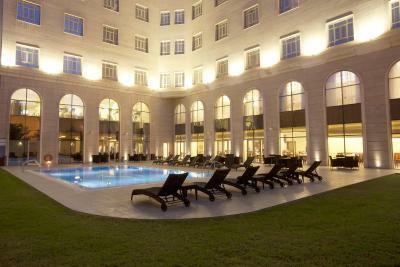 When would you like to stay at Concorde Hotel Doha? The suite is 80 m2 in size with one king sized bed. 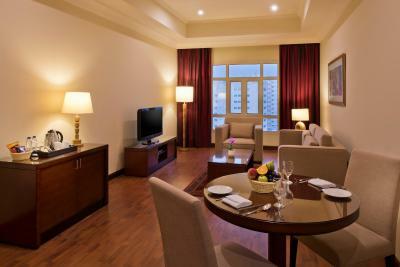 It features a flat screen TV, living area, coffee and tea making amenities, seating area, mini-bar, and work desk. The room is 40 m2 in size with twin beds or king sized bed. It features a flat screen TV, coffee and tea making amenities, mini-bar, and work desk. The two adjacent rooms are 120 m2 in size with two king sized beds. It features a flat screen TV, living area, coffee and tea making amenities, seating area, mini-bar, and work desk. 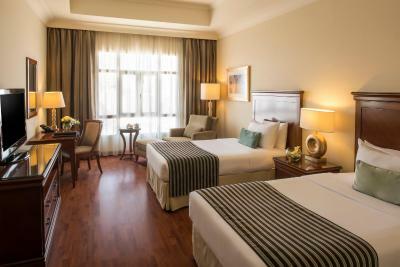 The two interconnecting rooms are with twin beds and one king sized bed measuring 80 m2 in size. It features a flat screen TV, coffee and tea making amenities, mini-bar, and work desk. 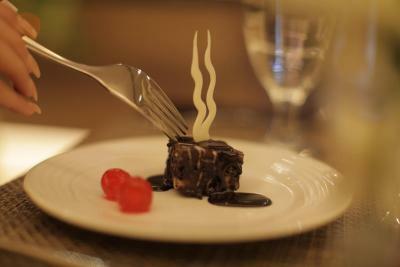 House Rules Concorde Hotel Doha takes special requests – add in the next step! Concorde Hotel Doha accepts these cards and reserves the right to temporarily hold an amount prior to arrival. Please note that children aged between 6 and 11 will be charged 50% on the buffet breakfast even if the room is booked with breakfast included. Adding breakfast when already at the hotel will cost more than buying it through Booking.com. Everything went well since my leg step into the reception. The reception agent was very helpful and she is understanding her duty very well. The door man and the security guy on duty were very helpful as well. There was quite cold in the room. Hotel was really flexible and as I had my flight too early they arranged that I could have my breakfast earlier than "reastaurant opens". Really thank you. Free transfer to airport was very useful. No Bar in hotel and not many toiletries in room. Room was good and comfortable, spacious. Good sleep. Airport is nearby. Hotel under ground parking space and arrangements but any however there outside free parking area. Gym facility does not allow kids under 16 years, normally other hotels allow kids with parents so they can use gym under parents control and supervision. Pool does not have shower so people can take shower before and after using the pool. Great place to stay, the staff is courteous and helpful. Not a 5 stars but barely a 4 stars hotel.